It's the London debut of Neile Adams and I was there to see it. Miss. Adams is not only a very talented dancer and singer, but has another claim to fame. From November 2nd 1956 until April 26th 1972 she was married to Steve McQueen. When they first met, Neile was the big star and Steve was very much a nobody. However, Neile gave up her career to have children and together they worked on Steve's career. By the late 1960's, Steve was the biggest star in the world. As Steve himself said, about their divorce settlement, "she deserves every penny, for without my old lady, there wouldn't have been any of it in the first place"
I first read about Neile coming to perform in London in the Daily Mail on Friday 14th April (click here to read the item). The following day, in the same newspapers, 'Weekend' magazine, they had a feature about Neile and her life with Steve, concluding with details of how to book to see her (click here to read this). I booked a couple of tickets and drove the 300 mile round trip to see her. My wife wasn't able to make it, so I got a friend of mine to come and act as photographer. It was certainly worth it! At first I had no idea what 'Pizza on the Park' was. Surely it wasn't a pizza restaurant? I thought I'd better wear my suit and tie and when I arrived at 7.30 pm on Monday 24th April 2000, I am surprised to find that it IS a pizza restaurant. However, Neile is appearing down in the basement which is a very posh restaurant. Good job I wore the suit! I have bought with me my first edition, hardback of Neile's book "My Husband, My Friend", in the hope of getting it signed. I ask about this possibility on arrival and I'm told that Neile is likely to be around in the interval. Neile is doing two separate shows - one at 9.30 pm and one at 11.00 pm. 11.00 pm arrives and Neile is back on for the second session. Sadly, a large number of diners have left, but she has been told that this will happen - its nothing personal. Neile performs well for the reduced audience and finishes at 11.35 pm - I presume it may have been longer had it not been for the reduced audience .......... but it was still a rousing performance. This is now my chance. Neile finishes and goes to chat to people at the back of the restaurant. The whole place is in virtual darkness apart from spotlights aimed at the tables. "Er, excuse me, Mrs Toffel (Neile remarried in 1980), may I have your autograph ............" Neile seems genuinely pleased to see me and is quite surprised when I produce her book to sign. 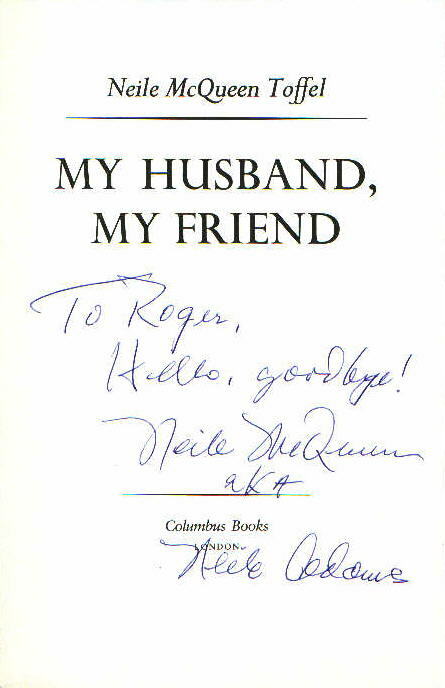 I ask her to sign 'Neile McQueen Toffel' (as that is how she is credited in the book) but she actually signs it 'Neil McQueen' and then 'Neil Adams'. I ask her if she ever uses the internet and she tells me she doesn't, so I tell her briefly about my website. I ask her if she would be willing to do an interview for my website and she readily agrees. I then ask her if she would pose for a photograph and I have my picture taken with her. I give her some written details and she agrees to give me a ring to sort out a suitable date and time for an interview. I thank her for her time and I am off. Neile rang me at 10.55 am this morning (British Summer Time). Neile said that after discussing the matter with her lawyers she had decided not to give an interview because she was a trustee of the Steve McQueen estate and they were having problems with people selling unauthorised Steve McQueen material over the internet. She didn't really want to be seen to be sanctioning any particular web site. ( I didn't bother to tell her that I already had an official licence from the Roger Richman Agency, (who represent the estate of Steve McQueen), to sell Steve McQueen T-shirts). I asked her if she would answer some questions just for my personal information and not for publication on my website. She answered a couple and then said that she really didn't want to answer any more, bearing in mind the advice she had received. I thanked her very much for taking the time and trouble to ring me.